Shoutbox is a great front office feature. This module allows you to add minichat for shop guests. Module uses AJAX technology, so it increases usability of shoutbox and your shop. With shoutbox module you can add great tool for interaction with shop guests and customers. 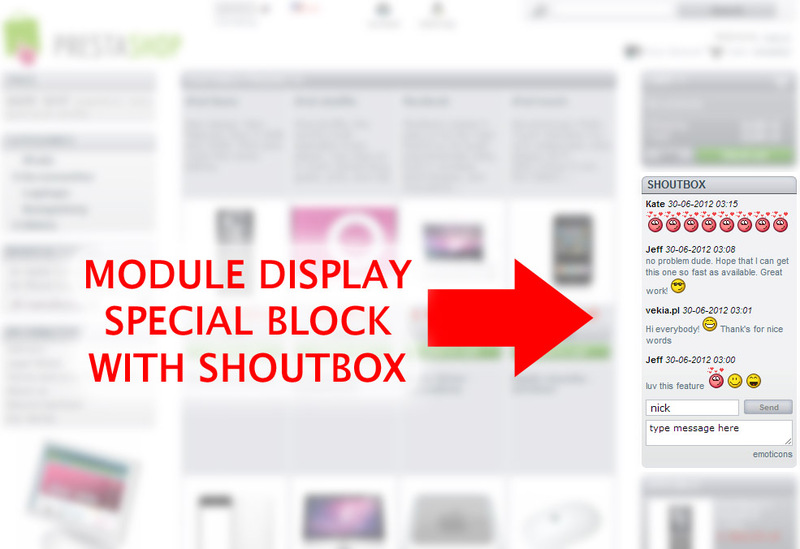 This module allows you to add special block with shoutbox. Shoutbox is a minichat feature, where shop guests can post a messages. With this module, you increase usability of your online store based on prestashop engine. Customers can post a messages into shoutbox. This "Shoutbox" feature allows them to talk among themselves, and with you. Module is based on AJAX technology which increase shop usability for your customers. Module adds a special block with shoutbox.